If you need a loan, you are not alone. Favorable loans have been difficult to come by and people don’t know where to go to get the best possible rate. This is where Even Financial comes in. The Fintech company dedicated to the supply side of financial services has built the infrastructure for loan discovery that can be integrated in a number of different applications including apps, publishing platforms, and portals. AlleyWatch spoke with the Even Financial team and discovered how they are innovating the Fintech industry. Even Financial is the first and only dedicated supply-side platform for online financial services. 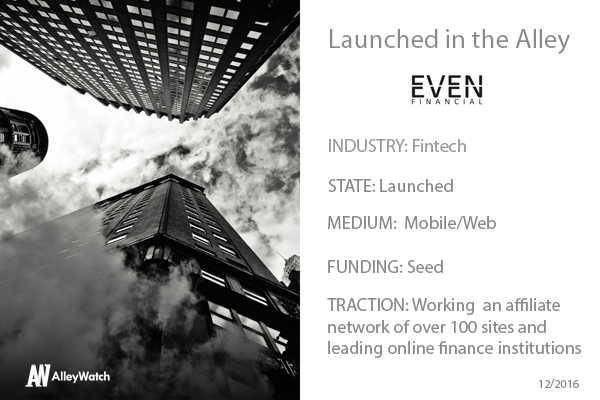 Even’s recommendation API matches customers with the right financial products and services at the right time, while providing transparency and reduced cost of acquisition to online financial service providers. Through this, Even Financial enables a new generation of real-time online financial products and services for both business and consumers. This is the first API to enable app developers and websites with direct access to often hard to reach financial services. Through a single endpoint they can integrate with over a dozen financial service providers and products. These aren’t display-ads, most often they are direct integrations into the financial service providers themselves. Developers and websites don’t pay us anything, in fact we pay them. Financial service providers pay us for access to customers and to ensure compliance across our network. We split these revenues with the app developers and websites. Finance is slowly and progressively moving online. Services that use to be offered together within a branch model are being broken off and offered directly to consumers by specialized companies online. This is great for the consumer, but its led to a complex web of hard to navigate relationships and regulations for websites, app developers and financial service providers. Even acts as an intermediary to simplify the ecosystem for all parties. We plan continued rapid growth in volumes across loan products. Meanwhile we are progressively adding additional financial services to our API. Recently we added credit cards, and we plan to scale that out much further. In the near future we are looking to including savings accounts and eventually mortgages and insurance. Everyone talks about the importance of focus, but no one really ever advised on how one can cut through a world of choices to identify the true critical path. Over the past 6 months we have learned to reduce most decisions to a simple criteria based on one or two purely data driven KPIs. It took a great deal of work to make the data available, but since doing that it has brought an unprecedented level of clarity to the whole team. I’m from NYC. I’ve been working at NYC startups since I was 18 and in/out of college. That, plus the fact that we are a financial services company makes it pretty much the only option in the US for me. I really enjoy good sushi. Yasuda is my historical favorite, but recently I’ve really been enjoying Sushi On Jones.